The miracle of Airborne, it is the herbal supplement that will prevent colds. My mother, a former middle school teacher swears by the stuff. She said that she can believe it because it was created by a teacher who used go through the same beginning of the school year germs like she did. Here is some information on the matter. At the beginning of each school year students and teachers alike get sick because after a long summer of not as much contact with people and germs, these people get crammed into a room and infect each other while the immune system is low. 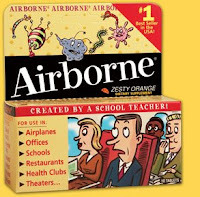 Airborne claimed to have a combination of fourteen herbs, vitamins, and minerals to help build up the immune system so that at the beginning of the school year you do not have to worry about getting sick. 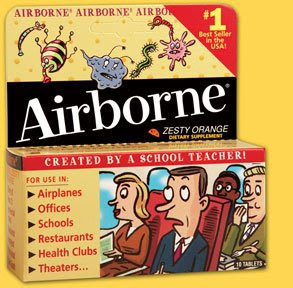 Back in 2008 Airborne settled a lawsuit for $23.3 million over the false advertising of being able to prevent colds. The interpretation and inference we can make from the settlement is that Airborne does not in fact prevent colds. We cannot base the settlement in fact because this case was never tried before a jury who produced a verdict of what was fact, but the settlement at such a high price with a promise to reimburse customers suggests that the product is somewhat a fraud. The assumption of people, like my mother, is that Airborne works. Airborne is still available for purchase wherever one can get medicine for colds. The implication of this belief that Airborne works is that causes consumers to purchase a useless supplement instead of medicine that could really help their sickness. Another implication is that it allows for other products similar to it to enter the market further confusing consumers. My personal thoughts are directed toward the claims by the medicine Zicam and its claims to shorten colds, I wonder if they will be the next major lawsuit payout. My thoughts are just speculative as I am not a science major and cannot prove any of my suspicions. I get sick a lot, whether it be the flu, cold, or allergies. I'm usually sneezing and coughing. I believe in drinking tea, and resting while my boyfriend SWEARS by this stuff. He's mad me take these things constantly. I personally don't believe in them and don't think they work, but the second he's sneezing you better believe he's drinking an airborn!